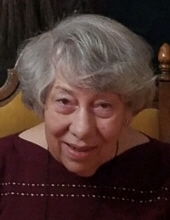 Lynette Kay Shull, 76, died peacefully on Friday, March 29, 2019 at Altercare of Bucyrus. She was born March 21, 1943 in Tiffin, Ohio to the late Albert R. and Alvena L. (Curtis) Gerhart. Her father died when she was eight years old. Years later, her mother married Kenneth Gerhart, who played an important role in Lynette's life. He also preceded her in death. Lynette, known by many as "Kay", moved to the Bucyrus area in 1959 and graduated from Sulphur Springs High School in 1961. On May 12, 1963, she married her high school sweetheart, Lynn R. Shull. They were happily married for 54 years, living all but 18 months of that time in Bucyrus, until Lynn's death in 2017. During that time living away from Bucyrus, Lynette enjoyed living in Yokosuka, Japan while her husband was serving in the US Navy from 1966 to 1968. Lynette is also preceded in death by the parents of her late husband, Bruce and Edna Shull. Lynette was employed locally at Scheck’s Market, Geyer’s and Bob Evan’s Restaurant but mostly enjoyed caring for her family as a homemaker. Over the years, she enjoyed preparing meals for her family and cherished many memories created with her children and grandchildren. She was a member of St. Paul’s Lutheran Church, Women of the Moose, and American Legion Ladies Auxiliary. Lynette is survived by one son, Christopher (Jenny) Shull and their two children, Bruce and Megan Shull of Tiro; one daughter, Danielle (Jon) Crall and their four sons, Eli, Ty, Ben and Abe Crall of Mount Orab, Ohio; four sisters, Carol Wasko of Virginia Beach, Virginia, Doyle McGlothlin of Marion, Judy (Duane) Fox of Chatfield, and Deb (Dan) Feichtner of New Washington; two brothers, Charles Gerhart of Houston, Texas and Ronald (Deb) Gerhart of Bucyrus; sisters and brothers-in-law, Karen Bartley, Carole (Jim) Gerhart and Ellen Stephenson all of Bucyrus and Lyle (Deb) Shull of Mentor as well as many nieces and nephews. All services will take place, Saturday, April 6 at St. Paul’s Lutheran Church, 130 S. Walnut St. Bucyrus. Visitation will be held from 10–12 noon immediately followed by a lunch gathering for those able to join the family. Lynette's funeral will begin at 1:30 p.m. with Pastor Mike Greenler officiating. Burial will follow in Oakland Cemetery in Tiro. In lieu of flowers, donations can be made payable to St. Paul’s Lutheran Church, Crawford County Council on Aging or a charity of the donor’s choice. These gifts will be accepted through Wise Funeral Service on the day of her services at the church. Memories are encouraged to be shared on her Tribute Wall. To send flowers or a remembrance gift to the family of Lynette Kay Shull, please visit our Tribute Store. "Email Address" would like to share the life celebration of Lynette Kay Shull. Click on the "link" to go to share a favorite memory or leave a condolence message for the family.